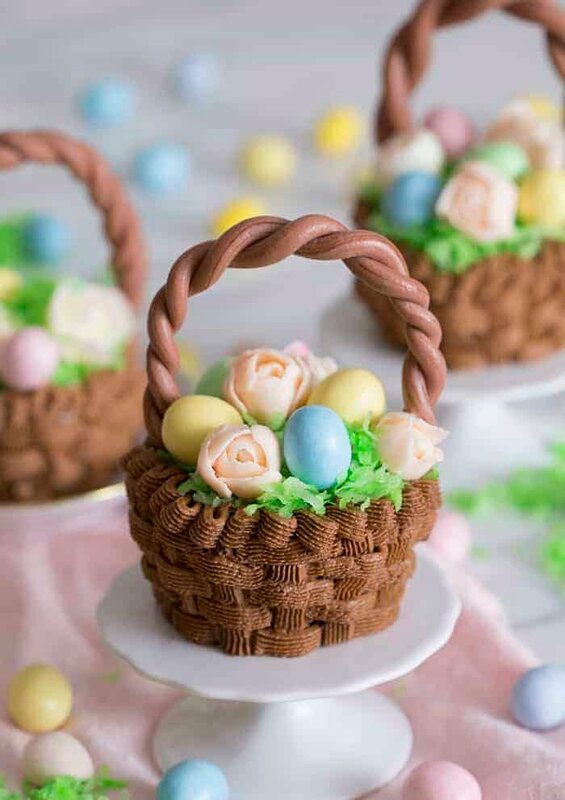 Darling and DELICIOUS chocolate cupcakes shaped like easter baskets filled with pastel buttercream flowers and chocolate eggs nestled in coconut grass. These beautiful cupcakes will delight your guests! Easter baskets are one of my favorite gifts to give and receive in the spring! I load mine up with chocolate bunnies, eggs and various marshmallow treats. My cupcake easter baskets are a delicious little treat to make for your next Easter gathering or spring fete! 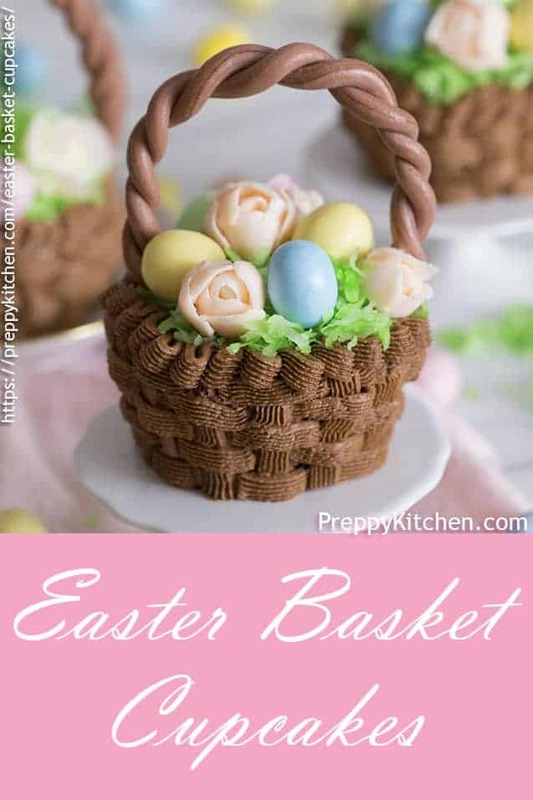 You’ll enjoy the rich moist chocolate cupcake inside but those little buttercream flowers and candy coated chocolate eggs will be fun to nibble on too! How do you make the best chocolate buttercream? Use a good quality cocoa powder and add salt to taste. I like to add close to a teaspoon of salt to my chocolate buttercream as I find it really provides a great balance. A teaspoon of espresso powder or a few splashes of coffee help to bring out that chocolate flavor too! THINKING ABOUT EASTER RECIPES? TRY THESE OUT! 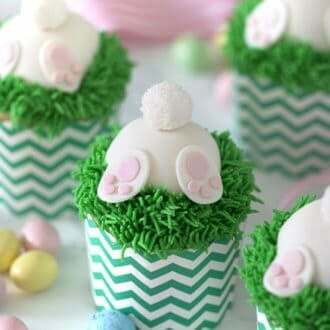 How do you make these Easter cupcakes? Roll out some brown fondant and twist together. Cut a short section and form into a “U” shape. Set aside to dry overnight if possible. Remove your cooled cupcakes from their papers and spread a thin layer of chocolate buttercream on. Use a #47 piping tip to pipe the basket pattern. Start with a vertical line. Add 2-3 horizontal lines then another vertical line with 2/3 horizontal lines connecting to the previous vertical line. Repeat until cupcake is covered. Finish the basket with a rippling line on top. Pipe the buttercream flowers using a smaller petal tip like a 120. 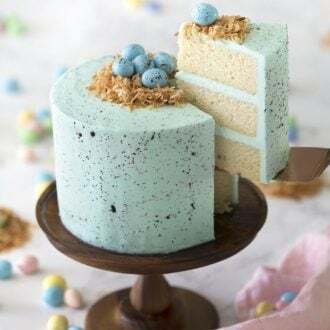 This is easiest when you start with a cone-shaped base of thick buttercream as the base. Add your green coconut to the cupcake. place the eggs and flowers. Definitely make the handles in advance. 1-2 days ahead is fine! They really need to set. 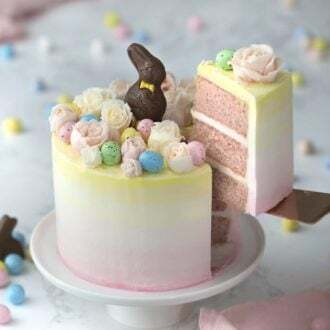 This looks really cute with just the eggs in so go ahead and skip the buttercream roses if you’re short on time. You can make a bigger version of this with a two layer 4 inch cake! Matching the fondant color to you buttercream can be a challenge. The easiest solution is a WHITE Easter basket! Practice the basket weave pattern on a plate first if you haven’t don it. It’s an easy technique but it’s better to work on the cupcakes once you’re confident. Use a 233, 234, or 29 tip to pipe buttercream grass if you’re not a coconut fan. If you prefer your frosting to be less sweet then try whipping up a batch of Swiss or Italianbuttercream. Silky smooth and delicious! 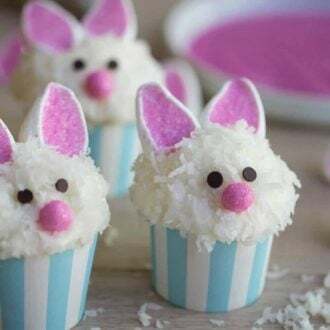 If you’ve tried these Easter cupcakes then don’t forget to rate the recipe and let me know how you got on in the comments below, I love hearing from you! These charming Easter Basket cupcakes are filled with buttercream roses, candy covered eggs and coconut grass. In a large bowl whisk together the flour, cocoa, salt, baking powder and baking soda. Cream the butter and sugar together in a medium bowl. Add the eggs one at a time making sure to mix thoroughly. Mix in the sour cream, vanilla and milk. While mixing on low speed add the wet ingredients to the dry and mix until just combined. Scoop the batter into cupcake papers filling 2/3 the way up. Bake at 350 for 20-25 minutes or until the centers are springy to the touch. In a stand mixer fitted with a paddle attachment, cream the room temperature butter until smooth. Sift in the confectioner’s sugar. You can add the sugar in two batches. 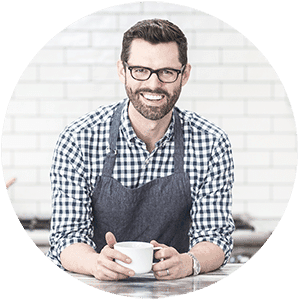 Beat until you get to a thick consistency. Add the vanilla extract. Reserve a small amount of buttercream in a bowl. Add more confectioners sugar and mix by hand until you get a play dough consistency. This will be used for the base of your flowers. Split the rest of the buttercream into 2 batches. Dye one batch brown and the other pink. Put brown buttercream into a piping bag fitted to a 47 tip. Put pink buttercream into a piping bag fitted to a 120 tip or a curved petal tip. Fold brown food coloring into the fondant until the desired color is reached. It should match the brown buttercream. Roll out the brown fondant to 1/4-inch. Each strand should be about 5-inches long. Twist two of the strands together to create the handle. Cut the ends with a knife for clean ends. Allow to dry overnight. Cut out 1-inch squares of parchment paper to use as a piping base for each flower. Mold a tiny amount of the play dough type buttercream into a cone and place it on the middle of the parchment paper square. Using the pink buttercream, start to pipe small petals around the cone. Start small and gradually go a bit bigger until you have your flower. Once your cupcakes have cooled, remove them from the cupcake papers. 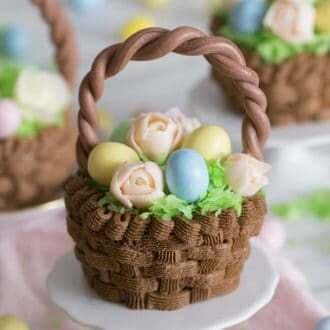 With the brown buttercream, use a basketweave technique to pipe the basket around the side of the cupcakes. Dye the shredded coconut green by adding coconut flakes and a few drops of green food coloring to a sealable plastic bag. Mix together and place on top of cupcake for the grass. Arrange the buttercream roses and chocolate candy eggs on top. 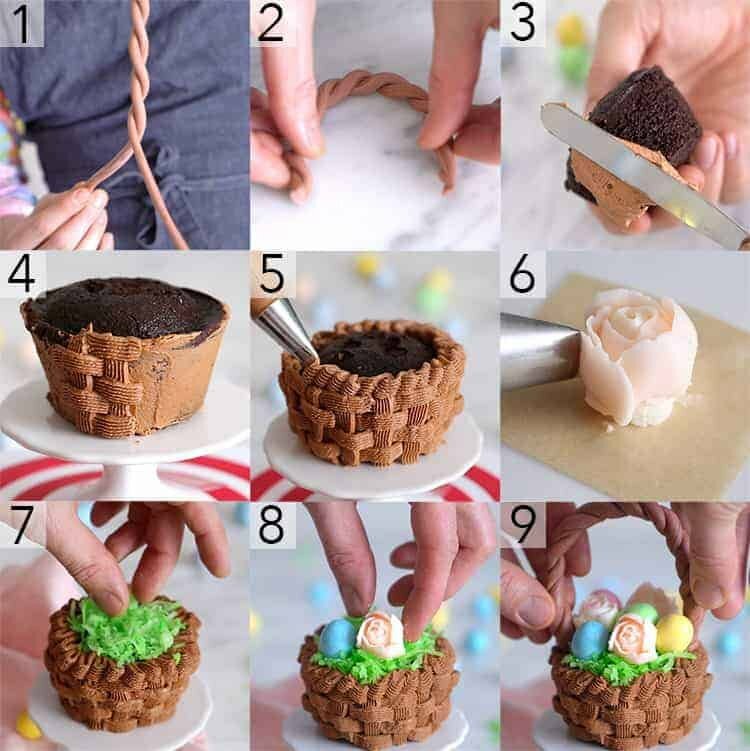 Carefully stick your basket handle into the cupcake. This looks really cute with just the eggs in so go ahead and skip the buttercream roses if you're short on time. Practice the basket weave pattern on a plate first if you haven't don it. It's an easy technique but it's better to work on the cupcakes once you're confident. If you don't have sour cream then plain yogurt will work just fine.